Essential oils, which are concentrated natural plant fragrances, have been used in medicine for more than 6,000 years, according to the University of Maryland Medical Center. Young children may benefit from the cautious medicinal use of these highly aromatic medicinal oils. Aromatherapy may help soothe the symptoms of colic, anxiety and restlessness in young babies. However, the misuse of aromatherapy can cause serious adverse reactions, including breathing problems and toxicity. To prevent unanticipated side effects, consult a qualified health-care provider and an aromatherapy practitioner before using any essential oil on your young child. Dilute one drop of essential oil into 1 oz. of almond oil. The National Association for Holistic Aromatherapy says that this low concentration is safe to use as a massage oil for a baby. Calming essential oils such as lavender and chamomile can facilitate relaxation in an anxious or restless baby. Dilute one drop of citronella, clove or eucalyptus oil in 3 oz. of water. Spray this mixture on a baby's arms, legs and torso to repel ticks and mosquitoes. 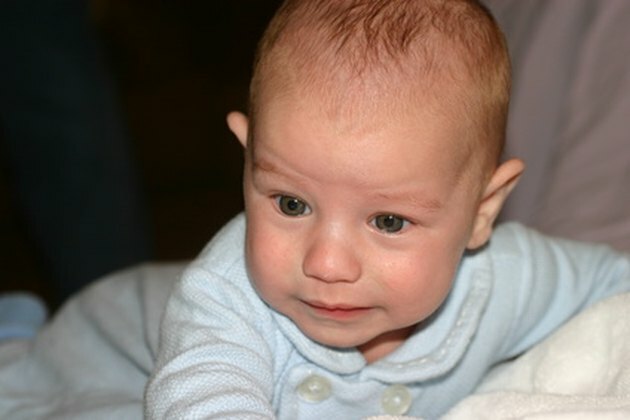 Although effective, these oils may irritate a baby's airway. The EPA advises parents to consult a physician before using citronella on a baby under 6 months of age. Do not apply them in high concentrations or close to the baby's mouth. Sprinkle one drop of lavender or neroli oil into your baby's bath. Fragrant oils can give the baby a pleasant scent while helping to soothe restlessness and anxiety. Use a commercial diffuser according to the manufacturer's instructions to spread an essential oil's scent throughout your home. The National Association for Holistic Aromatherapy regards this practice as safe for babies, noting that little of it is absorbed into the child's bloodstream. Eucalyptus oil in a diffuser may help to thin mucus and suppress a cough in babies with upper-respiratory infections. Mix one drop of fennel oil and one drop of ginger oil into 2 oz. of almond oil. Drizzle this mixture into the baby's bath or rub it onto his belly to ease colic, reflux, constipation, nausea and indigestion. Do not apply essential oils directly to a baby's skin. Most essential oils are poisonous when used internally. Do not give them to your baby by mouth. Do not use essential oils on or around your baby if he has a history of asthma or difficulty breathing.